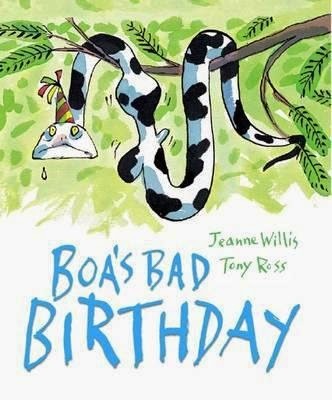 We've all been on the receiving end of a bad birthday present, but few of us have probably had to put up with quite as many inappropriate presents as poor Boa. First up is Orang-utan's gift — a piano. Generous but not much use to a snake with no fingers. The sunglasses from Monkey might be cool, but how can Boa get them to stay on his head when he's got no ears or nose? Mittens, a hairbrush, a football … all completely useless. By the time Dung Beetle arrives with his present, Boa's pretty despondent and frankly, when he sees the big pile of you know what, he doesn't think he's got much reason to cheer up. But, appearances can be deceiving. In fact, sometimes the best presents can be found in the most unexpected places. This is not only a very funny book, it's also a very clever one, as you'd expect from such a talented and experienced creative team. Good manners, coping with disappointment and discovering that the best things in life often come in unlikely packages are all touched on in such a warm and gentle way that little readers will find themselves absorbing some of life's great lessons without even realising it.